So to avoid such thing and to create a transparent and hassle free tax system we should file correction return and also suggest others to do so. When ever tds/tcs deposited by challan in bank, bank will issue a CIN (challan identification No) and upload the following data to the data base of Tin(tax information network) nsdl . when we file ETDS/ETCS RETURN than department will reconsile the data relating to challan submiited by bank and data submiited by us through etds return.If Challan identification Number (CIN),amount ,TAN etc. not matched with details given by us through ETDS return & details submitted by bank than diff will be shown as per coloumn "I" TO 'L" in above excel picture.Deductee's PAN will also verified /reconsiled on the basic of PAN in the ITD database. 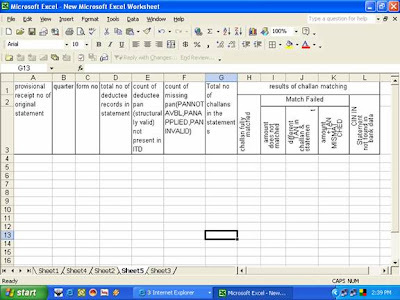 If PAN not matched with itd database than 'PAN not matched' will be shown in coloumn' E' in excel picture shown above.In coloumn' f' PAN not submitted in original return will be shown . in this screen a link on no of challan is given in blue colour by clicking this next scrren will appear as follows. In this window staus of every challan for a particular PRN is shown date wise whether it is booked or not.if booked status is shown than every thing is ok as far as challan is concerned.do not worry about status" match pending" also, as process is going on .but if status shown as "not matched" than detailed process given in cin based view can be checked.In screen given above there are two links one is given in "count of deductees "and second "pan not in ITD database".if we click on coloumn under "count of deductee" than follwing screen will appear. in this screen you can check deductees detail one by one through entering Pan And deducted amount.Or press back to challan status and click link in coloumn "pan not in itd data base". then following screen will appear. In this screen deductee sr no in filed return and wrong pan will be shown as above.No/invalid pan can be detected from original return . (This represent no's of deductees against which we have entereted "PANNOTAVBL",PANAPPLIED,PANINVALID')THIS detail is also genrated while creating FUV file in html format. once we noted down the incorrect pan/pan not given deductees detail as well as challan not matched detail than we have to file a revise return.revise return software are available in the market ,in fact it may be part of your present etds software.if not it can be downloaded fron tin nsdl website under download section. please check do and Donts while tax deposite article . moreover following two point should be keep in mind. 1.before filling every qtrly return verify from tin wib site whether all the challans you have deposited has been correctly uploaded by the bank against your TAN .if not than please enqire from the bank branch. In this window fill bsr code of collection branch,date of deposite,challan serial no given by the bank ,amount you will get the datail of tan and section under which amount has been deposited,this facility can be used after one week from depositing the challan.if "no recods found for the above query" message displayed then please re confirm the data you have entered even then no item displayed than contact the bank branch in which tax has been deposited to correct the data . In this screen TAN and period of data required will be selected and after clicking submit, detail will appear .detail will be shown without amount .fill the respective amount of challan and matched cases will appear in next screen. by both this methods you(tan Holder) can check status of tax deposit. 2. Collect PAN of deductee at the same time of tax deduction.Pan may also be verfied from the ITD website . DO not fill "PANINVALID,PANNOTAVBL,PANAPPLIED" against pan of the deductee in haste as it will only increase your work at later stage in shape of filing of correction return. hope it will help you .comment invited to improve my work.ques may also be asked, i will do my best to answer them as far as it is possible. now tin-nsdl has also publish a article on same subject on 12 july 2007.you should also read that.